I have one for sale! message me if interested. I have this version. It sounds great! All around classic! 'Headless Heroes" was the subject of one of the more implausible (but true) stories of Atlantic Records history. The CIA had been 'observing' Eugene McDaniels since the 1970 "Outlaw" album where he was pictured hanging out in a cemetary with a couple of beret-wearing 'revolutionary' babes toting machine guns on the front cover. They were so incensed by the lyrical content of the title track of his follow-up "Headless Heroes" that they brought it to the attention of Spiro Agnew and Richard Nixon; Nixon actually had a reel-to-reel playback in the oval office (with a transcript of the lyrics), and afterwards Spiro Agnew called Atlantic boss Ahmet Ertegun to demand the withdrawal of the album, in promotion at the time, which he did under duress. To rub salt into the wound, there was supposed to have been a 45 from the album, 'The Lord Is Back' b/w 'Tell Me Mr. President' which also got canned, the only evidence of which is the promo of 'Mr President'. Considering what had just happened It was probably just one step too far for Atlantic. Can you imagine Richard Nixon listening to this album in the White House surrounded by a bunch of suits ? Beggars belief, but goes to show just how paranoid his administration was at the height of the Vietnam war, going as far as censoring "pop' records. You'd think they had a few more important issues to address. Great album though....and as for the track "Headless Heroes" itself, McDaniels was incredibly prescient and right on the money. Very controversial album when it first dropped...goes to show..music and politics doesn't mix right! I have a sealed copy of the original of this now sort after classic for sale. 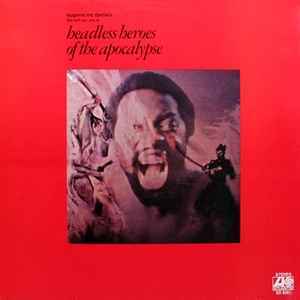 'Headless Heroes" was the subject of one of the more implausible (but true) stories of Atlantic Records history. The CIA had been 'observing' Eugene McDaniels since the 1970 "Outlaw" album where he was pictured hanging out in a cemetary with a couple of beret-wearing 'revolutionary' babes toting machine guns on the front cover. They were so incensed by the lyrical content of the title track of his follow-up "Headless Heroes" that they brought it to the attention of Spiro Agnew and Richard Nixon; Nixon actually had a reel-to-reel playback in the oval office (with a transcript of the lyrics), and afterwards Spiro Agnew called Atlantic boss Ahmet Ertegun to demand the withdrawal of the album, in promotion at the time, which he did under duress. To rub salt into the wound, there was supposed to have been a 45 from the album, 'The Lord Is Back' b/w 'Tell Me Mr. President' which also got canned, the only evidence is which is the promo of 'Mr President'. Considering what had just happened It was probably just one step too far for Atlantic. Can you imagine Richard Nixon listening to this album in the White House surrounded by a bunch of suits ? Beggars belief, but goes to show just how paranoid his administration was at the height of the Vietnam war, going as far as censoring "pop' records. You'd think they had a few more important issues to address. Great album though....and as for the track "Headless Heroes" itself, McDaniels was incredibly prescient and right on the money. A monster album that's gone onto influence a generation -- but which was barely recognized at the time! Singer Eugene McDaniels had scored big with some pop hits in the 60s under the name Gene McDaniels -- but here, he steps out in a righteous batch of offbeat funk tunes -- filled with politics, offbeat rhythms, and some very weird instrumentation. The whole thing's awash in moody, jazzy changes -- of the style that showed up often in samples by Tribe Called Quest, Beastie Boys, and other artists who drew keen inspiration from this record. Titles include the massive "Jagger the Dagger" -- plus "The Lord Is Back", "Lovin Man", "Headless Heroes", "Freedom Death Dance", and "Supermarket Blues". 'Jagger the Dagger' will always be the remembered and praised track from this superb album, but the quality does filter through to pretty much all the other tracks. 'Supermarket Blues' is an amusing tale about the Rev Mc. D purchasing a tin of pineapple slices which turn out to be peas and the resulting racial prejudice when he goes back to exchange his purchase. An all round great album as you might expect from a Joel Dorn production.